This week’s winner is @czabarte for a stunning picture of Vegas past, specifically Fremont Street in the late 50s or early 60s; at least that is my best guess. This is pre-Fremont St Experience, during the day and it is beautiful. 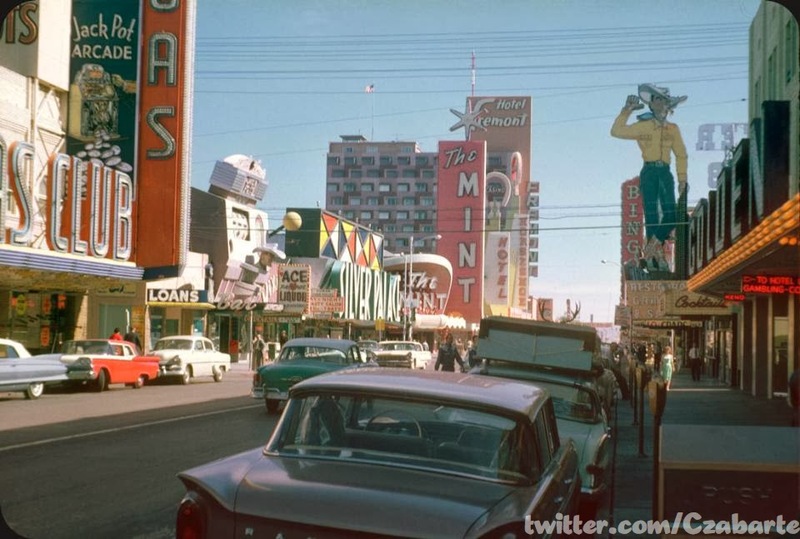 The picture inspired some spirited conversation among some of our listeners who thought the Fremont strip would be better served if they tore down the Fremont St Experience in favor of restoring it to its former beauty. This photo was taken by Golden Gate at the far west of Fremont St looking east. You can see part of Golden Gates street signage as well as part of the Las Vegas Club, Fortune Club and their large slot marquee, silver palace the Mint, the Pioneer club, Binion’s and Fremont tower over them all. Cars line the Fremont Strip and Vegas Vic has on his original yellow-checkered shirt. It’s a great picture of a time and place I can only visit in my dreams.